The T-bane/ Subway area has good exposure to the sun, even in winter. There are few buildings blocking out the light (but this could change over time). 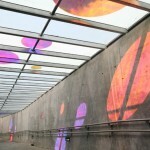 The pedestrian walkways are long and well lit by natural light, but with very little possibility of outside views. The basis for the idea was to find an expression that revealed the place’s distinctiveness; movement, the changing presence of people, meeting places and transitory connections. The project sought to combine a permanent installation with the desire for variation and therefore takes the opportunity to utilise the variations in light that occur in the area; the sun’s presence, the daily and seasonal rhythms. In addition there is the light that emanates from trams in movement and other lighting sources. To achieve the desired coloured, light paintings and refractions I used two types of transparent Lighting Films,- a dichroic film. The folios in themselves are colourless, but when light passes through them, the film’s properties refract the light in different ways. The colour that we see are the colours of white light refracted and the reflections we see are dependent on the angle we look at the film and the angle that the sun goes through the film. 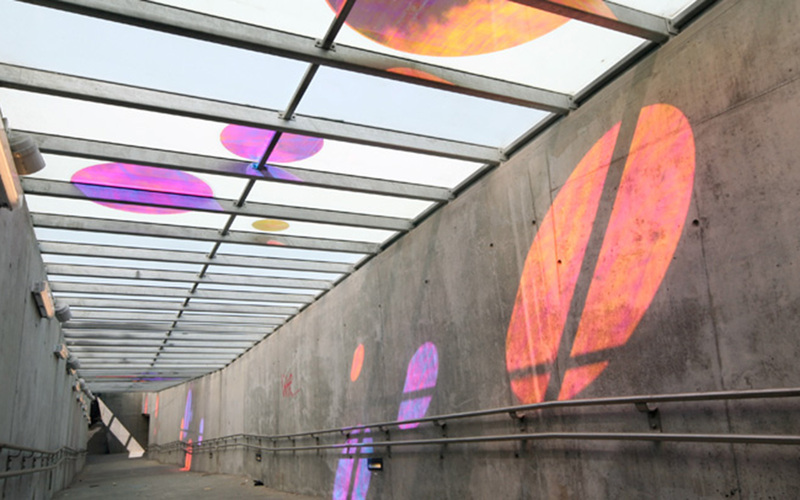 The public will experience the presence spots of light and reflections that appear on walls and floors differently and in different places, depending on the amount of light, the light source, angle and time of day. The combination of round shapes in the installation gives associations to the fleeting lightness of soap bubbles in the air,- transparency and spectral colour changes.